Looking for a special Baptism, Christening, or Dedication gift for your special Godchild? 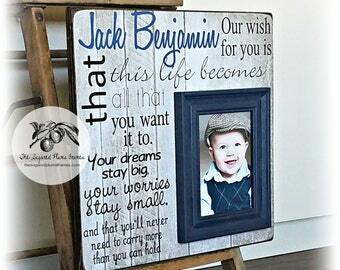 Our personalized picture frames are a great keepsake gift for your special godson or goddaughter. - Custom Text- Quote, lyrics, verse, names, date, birth info etc. You can type “as pictured” if you would like the same quote (no need to re-type) and then let us know any personalized text you may have in the “add personalization box). If you do not leave any notes during checkout, we will assume that you do not want personalization on your frame. - Font Preference (as pictured, script, print, handwriting, etc.). If you see something you like on one of our other listings-just copy and paste the link so we know which one it is. Or, if you have a particular style or you know the name of the font-just let us know in the “Add an optional note to seller” box during check-out. *If you selected the option to see a proof prior to production, please be sure to check your Etsy Conversations. You will receive a full color proof via Etsy Conversations within 2-3 business days. All proofs must be approved before we will proceed with your order. 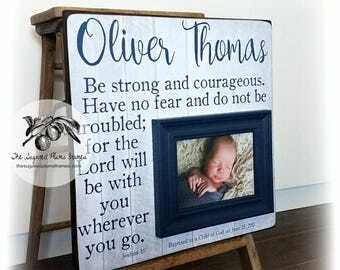 Love this as a baptism gift for my nephew and godson! 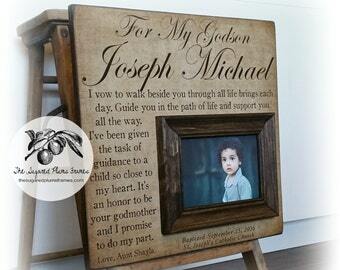 This was a baby dedication gift for my grandson. My daughter absolutely loves it and I have to say that when I opened the package it was more beautiful than I imagined it would be. Beautiful! I absolutely love it.